This D.I.Y. program began in 2009 under the name Bangkok Green bikes and was relaunched 2010 under its current name. The Free bikes are provided along locations for two bike routes, one on each side of the river. At a very leisurely pace well suited for seeing the city, each route takes little more than one hour. The areas popular tour zones noted in the family zones ebook, Rattanakosin zone includes a special D.I.Y. 6km walking tour and a excellent night open tram tour. Bike lanes are provided on the street and sidewalk—but, Bangkok being Bangkok, these lanes are not respected as dedicated bike lanes. Frequent obstructions should be expected from cars, pedestrians, vendors, and after 3pm on school days, multitudes of uniformed school children. It's more polite to bike around Thai people walking in the bike path than to ring the bell and expect them to move. Inevitable, because of crowded vending areas and blocked bike lanes, some riding will be with traffic in city street. Surprisingly, these bicycles are given more courtesy from drivers than might be expected. Week day: 10:00am-06.00 pm. Weekend : 10:00 am. – 08.00 pm. Thonburi (other side of the river) has several kiosks. update: Jan 2012: To take a free bike a passport or official looking photo ID is required (Passports not held). Bikes must returned to same kiosk. Maps are provided free of charge and mark the route and major sites along the way. The bikes are general good condition, the seat cannot be raised very high which may make it a little uncomfortable for tall people. Locks may be available on request, but riders are asked not to stray from the well-marked bike route. Bike helmets are not provided, but with the slow pace, the danger is not much greater than walking. East of the river, the route forms a continuous circle, you can pick up or drop of a bike at any kiosk. West of the river, the route is mostly marked and more of the ride will take place in the street. There is also a staircase or two to traverse, but the ride is extremely interesting as it goes through non-tourist areas. Some of the side trips (marked on the map but not on the pavement) are particularly interesting. The route is one-way starting at Somdej Phra Pinklao Road at Phra Pinklao Bridge across the river from the Bangkok Tourism Division office. They may run out of bikes late in the day. The 2nd Smile Bike kiosk is accessible by ferry, near the Thonburi Railway Station Pier and the old Thonburi Train Station (not to the actual train station, AKA: Bangkoknoi, which is about 800 metres inland from the pier and passed on the route). The bike route ends to the south at Wat Phichayayatikaram Worawiharn. The penultimate west-side Smile Bike kiosk is at the Memorial Bridge, which can pleasantly be walked over. 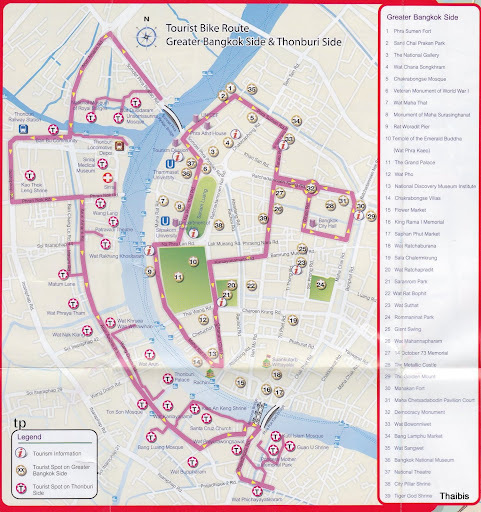 20-01-13 Bangkok Smile Bike is a free DIY bike hire for Bangkok zones of Rattanakosin and Thonburi.